Yata M., McLachlan A.J., Foster D.J., Hanzlicek A.S., Beijerink N.J. Single-dose pharmacokinetics and cardiovascular effects of oral pimobendan in healthy cats // J Vet Cardiol. 2016 Dec;18(4):310-325. INTRODUCTION: To investigate the pharmacokinetics and pharmacodynamics of oral pimobendan in conscious, healthy cats. ANIMALS: Eight healthy adult cats. MATERIALS AND METHODS: A randomised, single-blinded, crossover design was used. Two oral doses of pimobendan (0.625-mg [LD], 1.25-mg [HD]) and a control substance (3-mL water) were administered to each cat. Blood collection, echocardiography, and oscillometric blood pressure measurements were performed repeatedly for 12 h following each dose. Plasma concentrations of pimobendan and the active metabolite, O-desmethylpimobendan (ODMP), were quantified using ultra-high-performance liquid chromatography tandem mass spectrometry. Cardiovascular parameters were evaluated for between- and within-treatment effects over time using linear mixed modelling. RESULTS: Pimobendan was rapidly absorbed and converted to ODMP with the pimobendan AUC0-∞ greater than ODMP AUC0-∞(ODMP:pimobendan AUC0-∞ ratio 0.6 [LD] and 0.5 [HD]) despite a longer elimination half-life of O-desmethylpimobendan (ODMP) (pimobendan t1/2 0.8 h vs. ODMP t1/21.6 h [LD]; pimobendan t1/2 0.7 h vs. ODMP t1/2 1.3 h [HD]). Averaged across all time points, pimobendan increased several measures of systolic function; however, its effect could not be further characterised. Although treatment was well-tolerated, two cats vomited following HD and another had a ventricular premature beat recorded following LD. CONCLUSIONS: The lower ODMP:pimobendan AUC0-∞ ratio compared to that observed previously in dogs suggests reduced metabolism in cats. Treatment effects were observed in measures of systolic function; however, the duration of action and differences in effects between the two pimobendan doses could not be characterised. Further studies are required to evaluate pimobendan in feline cardiovascular medicine. Pimobendan is utilised in the treatment of canine congestive heart failure . It primarily produces positive inotropic and vasodilatory effects via phosphodiesterase III inhibition and calcium sensitisation [1e6]. Additional effects such as positive lusitropy, improvements in myocardial compliance, regional increases in coronary blood flow, and positive effects on myocardial oxygen consumption have also been reported [6e13]. Following administration, it is metabolised to an active metabolite,	O-desmethylpimobendan (ODMP, or UD-CG 212 CL), which induces similar inodilatory effects, primarily through phosphodiesterase III inhibition [14—16]. In the past decade, the off-label use of pimobendan in cats with congestive heart failure has received increasing attention. A number of retrospective studies evaluating pimobendan use in cats with heart failure due to a variety of aetiologies suggested that the drug was tolerated well and did not negatively impact morbidity and mortality [17—20]. Despite this, published literature on the cardiovascular effects of treatment in this species remains sparse. To date, only one study has reported the direct haemodynamic effect of pimobendan in cats . This study utilised anaesthetised cats and cumulative dosing methods. Pimobendan produced a dose-dependent increase in ventricular contractility and heart rate and reduction in diastolic blood pressure. The interpretation of these findings, however, is complicated by the influences of anaesthesia, and the duration of drug effects were not evaluated. More recently, the effect of multiple doses of pimobendan on left atrial function and size in healthy cats was evaluated indirectly via echocardiography . Although pimobendan treatment reduced maximal left atrial diameter and volume, the left atrial function did not change significantly. The cats utilised in this study were sedated for echocardiography, and the duration of effect was not evaluated. Two of the aforementioned retrospective studies also evaluated haemodynamic effects after a period of treatment with multimodal therapy which included pimobendan [17,18]. Limitations to the data from these studies include a wide range of time to follow-up evaluation, lack of information regarding the temporal relationship of measured effects to time of dosing, inability to differentiate the effect of pimobendan from that of other medications which were administered concurrently, and low numbers of animals for which follow-up data were available. Thus, the dose-response relationship of pimobendan in cats remains poorly understood. In 2012, Hanzlicek et al. prospectively evaluated the pharmacokinetics of oral pimobendan administered to healthy cats at a dose similar to that used in dogs (0.25—0.30 mg/kg administered orally twice daily) . A major finding from this study was that the peak plasma concentration of pimobendan was approximately ten times higher than that previously described in dogs given similar doses , and the elimination half-life of pimobendan in cats was also longer. Unfortunately, the active metabolite was not measured; as such, the total body exposure to all of the active moieties related to pimobendan could not be clarified. It is possible that the presence of higher pimobendan concentrations may, for example, be due to a relative lack of conversion of this compound to O-desmethylpimobendan (ODMP). This pimobendan metabolite is more potent but less effective, than pimobendan in vitro [15,16]. Thus, interspecies differences in drug disposition may contribute towards a difference in cardiovascular response. In particular, reduced metabolism of pimobendan may result in greater cardiovascular effects in cats. The importance of clarifying the response to drug administration (pharmacodynamics) and need for further evaluation of pharmacokinetics in this species was highlighted. The aim of the present study was to address this knowledge gap by investigating the pharmacokinetics and cardiovascular effects of two single doses of pimobendan administered orally to healthy cats. We hypothesized that conversion of pimobendan to the active metabolite may be low in cats and that treatment with pimobendan would cause measurable effects in echocardiographic parameters representing systolic function. Eight healthy adult cats (two entire males, five neutered males, and one spayed female; weight 3.7—4.8 kg; age 1—4 years) that were amenable to handling were utilised in this study. The cats were sourced from a contract research facility. Each cat underwent a full physical examination, echocardiography, electrocardiography, and blood pressure evaluation to ensure that no significant physical or cardiovascular abnormalities were present. The methods utilised in this study were approved by the University of Sydney Animal Ethics Committee (Project 678). A randomised, single-blinded, cross-over design was used to investigate the pharmacokinetics and cardiovascular effects of two single doses of pimobendanf in these cats. Three treatment conditions consisting of low-dose pimobendan (LD — 0.625-mg pimobendan PO; equivalent to a median dose of 0.14 mg/kg with range 0.13—0.17 mg/kg), high-dose pimobendan (HD — 1.25-mg pimobendan PO; equivalent to a median dose of 0.28 mg/kg with range 0.27—0.32 mg/kg), and water as a control (3-mL water PO) were tested in each cat. Before the study, each cat was assigned to receive one of three treatment sequences (water, LD, HD; HD, water, LD; and LD, HD, water) via a random draw by an assistant. All investigators involved in sampling procedures remained blinded to the order of treatments until measurements were completed. The study was conducted over a two-month period (January—March, 2015) at the University Veterinary Teaching Hospital, Sydney. Following arrival at the clinic, cats were acclimatised for a minimum of three days before receiving the first dose of treatment. During this time, cats were also familiarised with echocardiography and blood pressure techniques. Cats were fasted overnight for a minimum of 10 h before administration of each dose. On the first day of dosing, cats were treated with the first assigned treatment by an assistant who did not perform any of the sampling proce¬dures or recording of measurements. The investigators were not present in the room at the time of dosing. Oral tablet dosing was followed by administration of water (3 mL) to encourage oesophageal transit. Blood samples (3 mL) were collected via jugular or cephalic venipuncture at 20 min, 1, 2, 4, and 6 h following dosing. Echo¬cardiography, heart rate (HR), and blood pressure measurements were obtained before dosing, then 20, 40 min, 1, 2, 4, 6, 8, 10, and 12 h following dosing. Cats were fed 2 h following dosing. These procedures were repeated for each subsequent dose, which was administered 1 week apart to give a seven-day wash-out period between doses. This was deemed to be adequate for recovery from study procedures and was greater than five times the elimination half-life of pimobendan (~1.3 h) as described in a previous study . Deviations from this protocol occurred on several occasions. Cat 7 received a dose of treatment (HD) 2 h before the scheduled time on the first day of treatment. The cat was fed immediately thereafter in an attempt to reduce absorption of the drug, and no cardiovascular measurements were taken on this day. This cat was allocated a different treatment order, and the cat received the newly allocated treatment (water) 48 h later. Because cardiovascular measurements were not taken on this day, and based on the previously reported elimination half-life of pimobendan in cats , the 48 h wash-out period was deemed to be adequate. On another occasion, one dose of treatment (HD) thought to have been given to cat 8 was found intact in the cage 3.5 h following dosing. It was suspected that this tablet was most likely regurgitated shortly following administration. In order to maintain blinding, the investigator performing echocardiography (N.J. Beijerink) was not advised of thisfinding. The data collected on this day was categorised as being under the water treatment, and the cat was treated the subsequent week with HD pimobendan instead of the scheduled water treatment. Blood was not collected from one cat (cat 8) that did not tolerate venipuncture, and one othercat (cat 1) only had blood collected twice after treatment with LD due to development of strong aversion towards this procedure at this occasion. Blood samples were collected in plastic tubes coated with lithium heparin, placed on ice, and centrifuged at 15,800 RPM for 150 s within 20 min of collection. Plasma was separated and placed on ice for up to 1 h before freezing. Plasma was stored at or below -20 °C for four to six months before analysis. Greater than 90% recovery of pimobendan from frozen canine plasma samples stored for two months has been reported , but the stability of pimobendan in frozen feline plasma is unknown. Plasma concentrations of pimobendan and ODMP were determined by ultra-high-performance liquid chromatographyg coupled with a mass spectrometerh (UHPLC-MS) at a commercial analytical laboratory* i. A previously validated assay with minor adjustments was employed . Briefly, 40 mL of pimobendan-d3 (internal standard) and 350 mL of acetonitrile were added to 200 mL of plasma after thawing at room temperature. The mixture was vortexed and centrifuged. Subsequently, 200 mL of water was added to improve the chromatography and centrifuged again. The supernatant was passed through a 0.45-mm Hydraflon® filter, and 5 mL of this solution were injected into the system. g Eksigent ekspert ultra LC100; AB Sciex, Redwood City, CA, USA. h AB Sciex API3200, AB Sciex, Framingham, MA, USA. i PIA PHARMA Pty Ltd, Gladesville, NSW, Australia. Reverse-phase chromatography with a Dionex Acclaim Polar Advantage II column (2.1 x 150 mm, 3 mm)j maintained at 40 °C was performed. The mobile phase consisted of formic acid (0.1% in water) and acetonitrile in gradient mode at 0.5 mL/min, and the total run time was 3 min for each sample. Tandem mass spectrometry was utilised for identification of the compounds, and calibration curves (R2 > 0.99) spanning 0.2—60 ng/ mL (pimobendan) and 0.4—25 ng/mL (ODMP) generated from matrix matched calibration standards were utilised for quantitation of each compound. The lower limit of quantitation was 0.2 ng/mL for pimobendan and 0.4 ng/mL for ODMP. All samples were analysed on a single day. For concentrations above the lower limit of quantitation, the mean accuracy and precision (% CV) for pimobendan ranged between 99.9—116% and 0.9—7.4% respectively and the accuracy and precision (% CV) for ODMP ranged between 105.7—116.9% and 1.8—8.0% respectively. Cats were manually restrained in right and left lateral recumbency without sedation. Echocardiography was performed by a veterinary cardiologist certified by the European College of Veterinary Internal Medicine (N.J. Beijerink) using a commercially available ultrasound system equipped with a 3.5—8 MHz sector transducer and simultaneous electrocardiographyk. 2D evaluation in the right parasternal short axis view was utilised to obtain the thickness of the interventricular septum in systole and diastole (IVSs, IVSd), left ventricular internal diameter in systole and diastole (LVIDs, LVIDd), and thickness of the left ventricular posterior wall in systole and diastole (LVPWs, LVPWd). This method of evaluation of the left ventricular indices was selected as end-systolic cavity obliteration, which produced interference caused by papillary muscles entering the sampling beam on M-mode, was present at times during the study. The fractional shortening (FS) was calculated as (LVIDd — LVIDs)/LVIDd * 100. The left apical five chamber view was utilised to measure the peak aortic velocity (Ao Vel). The HR was calculated using the R—R interval between four to five consecutive beats captured during Ao Vel interrogation. j Thermo Fisher Scientific, Scoresby, VIC, Australia. k Vivid I; General Electric Healthcare, Silverwater, NSW, Australia. l VetHDO monitor; Memo Diagnostic, Darmstadt, Germany. An oscillometric blood pressure devicel coupled with an appropriately-sized inflatable cuff (40—50% of the circumference of the limb) placed on the tail base or the right foreleg was utilised to obtain the systolic (SBP), mean (MBP), and dia¬stolic (DBP) blood pressures. The cats were placed in sternal recumbency for tail measurements or restrained in a sitting position with the limb held up at the level of the chest for forelimb measurements. Measurements were taken repeatedly until three consecutive or near-consecutive readings with good-quality pressure curves and little variability were obtained. For each cat at each time point, echocardiogram, HR, and blood pressure measurements were obtained in triplicates and averaged. Consecutive beats were utilised for the majority of measurements. On the day after arrival at the clinic, six of the eight cats underwent echocardiography at 9 AM, 11 AM, 1 PM, 3 PM, and 5 PM. Echocardiography was performed by a single investigator (N.J. Beijerink), and six cardiac cycles from each time point were utilised to obtain the coefficient of variation for the investigator. The overall coefficient of variation (mean ± standard deviation) was 7 ± 3% for IVSd; 10 ± 5% for IVSs; 4 ± 2% for LVIDd; 8 ± 5% for LVIDs; 9 ± 3% for LVPWd; 10 ± 4% for LVPWs; and 3 ± 2% for Ao Vel. The effect of time on the coefficient of variation for each parameter was assessed using linear mixed modellingm. The time was set as a fixed effect, and the cat ID was set as a random effect. There were no significant effects of time on the coefficient of variation (p>0.05). Inter-day and inter-cat variations were not assessed. Pharmacokinetic analysis was performed using non-compartmental analysis on the plasma concentration-time data using a Microsoft Excel plug-in software program (PK Solver) . The linear trapezoidal method was utilised for calculation of the area under the curve to the last observed concentration. The slope of the terminal portion of the concentration-time plot (kel) was utilised to extrapolate this to infinity (AUC0—N). The elimination half-life was calculated as ln2/kel. The apparent clearance (CL/F = dose/AUC0—N) and the apparent volume of distribution (CL/F/kel) were also calculated for pimobendan. The pharmacokinetic data were reported as median and range unless otherwise specified. m GenStat 16th Edition, VSN International Ltd, Hemel Hempstead, UK. Where the Treatment*Time interaction was not significant (p>0.05), the term was dropped from the model. For all significant effects (p<0.05), subsequent evaluation of pairwise comparisons was performed using least square differences of the means with a nominated significance level of 5%. None of the cats voluntarily ate the treatments offered; however, treatment was tolerated well in all cats during the study. Blood samples were collected from seven cats following HD treatment (cats 1—7), six cats following LD treatment (cats 2—7), and seven cats following water treatment (cats 1 —7). One cat (cat 6) vomited a small amount of liquid within 10 min of the HD treatment. Although the tablet could not be identified in the vomitus, the measured plasma concentrations were not higher than those obtained following LD treatment in this cat. In another cat (cat 7), the measured plasma concentrations were much lower than the concentrations observed in other cats at both the HD and LD treatments. There was no discernible reason (e.g. vomiting, diarrhoea, hypersalivation, incom¬plete dosing, physical exam abnormalities, or other abnormalities in assessment of clinical wellbeing) throughout the course of the study for this. The data for these two cats (cats 6 and 7) were reported separately. Pimobendan treatment resulted in detectable concentrations of pimobendan and ODMP from the time of first sampling in the majority of cats (Fig. 1). As expected, HD tended to produce higher plasma concentrations of both compounds com¬pared to LD. In the majority of cats, the maximal plasma concentration of pimobendan occurred at the first sampling point (20 min); as such, the ascending phase of plasma drug concentrations for pimobendan could not be captured for these cats. However, the elimination phase was adequately captured (percentage extrapolation for AUC0—N was <7% for pimobendan and <14% for ODMP for all cats, including cats 6 and 7). A summary of pharmacokinetic parameters is presented in Table 1. Pimobendan and ODMP pharmacokinetics in dogs treated with 0.26—0.28 mg/kg of oral pimobendan solution  has also been included in this table for comparison. Both the HD and LD treatments resulted in rapid absorption of pimobendan and conversion into ODMP (median pimobendan Tmax 40 min [LD] and 20 min [HD] and ODMP Tmax 1 h [LD and HD]). For both doses, the AUC0—N for pimobendan appeared to be higher than for ODMP. Inspection of the ratios of AUC0—N of ODMP to pimobendan showed a median AUC0—N ODMP:pimobendan of 0.6 (range 0.5—0.8) for LD treatment and 0.5 (range 0.4—0.7) for HD treatment. A summary of pharmacokinetic parameters for cats 6 and 7 are presented in Table 2. No active compounds were detected in samples from all seven cats in which plasma samples were obtained following water treatment. Figure 1 Individual concentration-time plots for plasma concentrations of pimobendan (A) and O-desmethylpimobendan (ODMP) (B) following single oral administration of low-dose (0.625 mg; n = 4) and high-dose (1.25 mg; n = 5) pimobendan. Concentration-time plots of pimobendan and ODMP in cats 6 (C and D) and 7 (E and F) are presented separately. Dashed line = low-dose pimobendan; solid line = high-dose pimobendan. Data from 6 cats (cats 1—5 and cat 8) were included in the cardiovascular analysis. The data from cats 6 and 7 were excluded for aforementioned reasons pertaining to the pharmacokinetics. Although cat 8 did not have blood samples taken (and therefore, did not undergo all of the same procedures as the other seven cats in the study), this was consistent across all three treatments. The data from cat 1, who did not complete the full extent of blood collection after LD treatment, were also included as this cat largely underwent the same conditions for all three treatments. The baseline haemodynamic values were similar for all treatments (Table 3). However, the MBP and DBP at baseline for HD treatment were significantly lower than for water treatment (p<0.05). The MBP for HD was also significantly lower than for LD treatment (p<0.05). 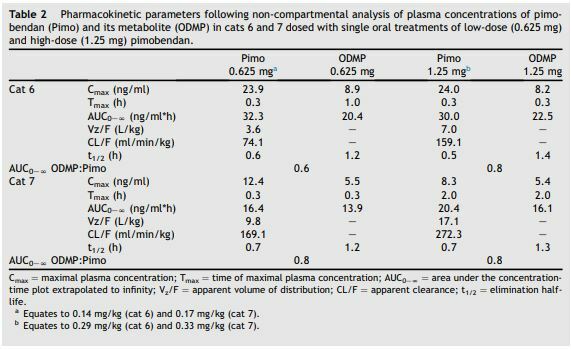 Table 1 Pharmacokinetic parameters (median, range) following non-compartmental analysis of plasma concentrations of pimobendan (Pimo) and its metabolite (ODMP) in cats dosed with single oral treatments of low-dose (0.625 mg; n = 4) and high-dose (1.25 mg; n= 5) pimobendan. The effect of each treatment over time is demonstrated in Fig. 2. On visual inspection of the graphs, pimobendan treatment appeared to increase Ao Vel, FS, IVSs, IVSd, and LVPWd within the first few hours of treatment. LVIDs and LVIDd appeared to decrease. However, similar trends were observed following water treatment for many of these parameters. In addition, a high degree of variability was observed for all of these parameters. Using this model, the effect of treatment averaged across the entire sampling period (0—12 h) was evaluated. The relevant group means are presented in Table 4. Averaged across all time points, both HD and LD treat¬ments were associated with a significantly higher Ao Vel, IVSs, IVSd, and significantly lower LVIDs, than water treatment (p<0.05). Table 2 Pharmacokinetic parameters following non-compartmental analysis of plasma concentrations of pimobendan (Pimo) and its metabolite (O-desmethylpimobendan (ODMP)) in cats 6 and 7 dosed with single oral treatments of low-dose (0.625 mg) and high-dose (1.25 mg) pimobendan. HD treatment was also associated with a significantly higher FS than water treatment (p<0.05). The SBP was higher with LD treatment than with HD or water (p<0.05). The HR was lower with HD treatment than with LD or water (p<0.05). The LVPWs was also higher for HD treatment than for LD treatment (p<0.05). In this study, the pharmacokinetics and pharmacodynamics of two single doses of pimobendan were evaluated in healthy, conscious cats. The pharmacokinetic relationship between pimobendan and ODMP was identified and the haemodynamic responses following pimobendan treatment were described. Figure 2 Graphical representation of cardiovascular parameters over time following water (3-mL water), low-dose (0.625-mg pimobendan), and high-dose (1.25-mg pimobendan) treatments in six cats. The mean and standard deviation have been plotted. Abbreviations: Ao Vel = aortic velocity; DBP = diastolic blood pressure; FS = fractional shortening; HR = heart rate; IVSd/s = interventricular septum thickness in diastole/systole; LVIDd/s = left ventricular internal diameter in diastole/systole; LVPWd/s = left ventricular posterior wall thickness in diastole/systole; MBP = mean blood pressure; SBP = systolic blood pressure. Solid lines represent water (3 mL water) treatment. Dotted lines represent low-dose (0.625-mg pimobendan) treatment. Dashed lines represent high-dose (1.25-mg pimobendan) treatment. a and b denote significant deviations from time zero (p<0.05) at the specified time for the high-dose (1.25-mg pimobendan) and water (3-ml water) treatments respectively. X and Y indicate significant differences (p<0.05) between the high-dose and water treatments and low-dose and water treatments respectively at the specified time. The pimobendan pharmacokinetics from this study were generally in agreement with those previously reported in the cat . There were some differences in the magnitude of parameters that may be attributable to differences in sampling schedule, analytical method, and method of pharmacokinetic evaluation. In both studies, pimobendan was absorbed rapidly after oral administration, displayed a high apparent volume of distribution, and was eliminated readily from the plasma. High plasma concentrations of pimobendan were observed, with the Cmax and AUC0_N being higher than previously reported values from studies evaluating pimobendan pharmacokinetics in dogs given similar mg/kg doses [24,25]. Potential reasons for these findings include a higher bioavailability or a lower clearance (i.e. conversion to ODMP or elimination via faecal/ urinary excretion) in the cat. Table 4 Treatment means averaged across time (0—12 h post treatment) for select cardiovascular parameters following water (3-mL water), low-dose (0.625-mg pimobendan), and high-dose (1.25-mg pimobendan) treatments in six cats. Intravenous administration of pimobendan and ODMP was not performed in our study. As such, the absolute bioavailability could not be determined. Clearance and volume of distribution reported here are also estimated values corrected for an unknown bioavailability. This is a limitation of the study that prohibits between-species evaluations of these parameters. However, an important factor that can be explored through our data is the potential for inter-species differences in the metabolism of this drug. Comparisons of our data with published data in dogs show that the elimination half-life of pimobendan and ODMP were similar between cats and dogs (Table 1). Interestingly, the AUC0—N of pimobendan appeared higher than the AUC0—N of ODMP in cats, which is in contrast to what has been reported in dogs (Table 1). This resulted in the ratio of AUC0—N ODMP:pimobendan being lower in cats than in dogs (median 0.5, range 0.4—0.7 in cats for HD vs. median 1.6, range 1.2—1.7 in dogs). This reduced AUC0—N ratio in the face of similar elimination profiles in dogs and cats suggests a relatively reduced conversion of pimobendan to ODMP in cats. Pimobendan con¬version to ODMP involves specific cytochrome P-450 isoenzymes in humans . In addition, both pimobendan and ODMP are ultimately glucuronidated and excreted . Because differences in the activity of cytochrome P-450 isoforms and ability to glucuronidate compounds have been identified between dogs and cats [29—34], these pathways could be contributing towards the difference in metabolism of pimobendan in these two species. A difference in pharmacokinetics between species may result in interspecies variation in response to treatment. Thus, two doses of pimo¬bendan were utilised in our study to investigate the potential effect of dose. A non-invasive study design which we have previously employed for the detection of pimobendan effects in dogs  was chosen to avoid the impacts of general anaesthesia and instrumentation whilst providing the additional benefit of being clinically applicable. Averaged across the sampling period, HD and LD treatments were associated with significant differences from water in some echocardiographic parameters representing systolic function (increased Ao Vel and FS and decreased LVIDs for HD; increased Ao Vel and decreased LVIDs for LD). These changes reflect the positive inotropic effects of pimobendan. In general, HD was significantly different to water in a greater number of parameters than LD was to water. We were unable to characterise the duration of effects, timing of maximal effects, and any difference in effects between the two doses of pimobendan. Major complicating factors included the high degree of variability in the data, the small number of cats in our study, and the presence of similar haemodynamic trends which were observed following the water treatment. These contributed towards obscuring both the within- and between- treatment effects over time as evidenced through the non-significant interaction term in the model. It is possible that the intensive handling, venipuncture, and greater environmental activity in the hospital during the first few hours of sampling may have contributed towards increased anxiety in the cats regardless of the treatment administered. With so many similarities in the cardiovascular changes expected with anxiety and with pimobendan treatment, and because pimobendan treatment did not result in haemodynamic changes that extended beyond reported reference ranges  on the majority of occasions, it would be impossible to fully separate the relative contributions of anxiety and treatment in conscious animals. Retrospectively, more extensive training of the cats for these procedures may have been helpful to reduce some of the anxiety experienced during the study. It is also possible that non-invasive methods of monitoring may not have been sensitive enough to detect consistent treatment effects in cats. On several occasions with both HD and LD treatment, end-systolic cavity obliteration of the left ventricle was observed. This may have contributed towards measurement errors and prohibited dif¬ferentiation of the maximal positive inotropic effects between the two doses of pimobendan. With the size of the heart being small in cats, small inconsistencies in measurements between indi¬vidual cats and across time points could contribute towards enough variability in the data to obscure treatment effects. Variable correlations between direct and oscillometric techniques of blood pressure monitoring have also been observed previously in this species [36—39]. It is possible that this contributed towards the wide range of blood pressures observed. In our study, there was a focus on measuring ventricular systolic indices as they were commonly measured parameters which reflect the primary effect of pimobendan. However, diastolic dysfunc¬tion plays a large role in feline heart disease due to the propensity of this species to develop hypertrophic and restrictive cardiomyopathies. In these conditions, atrial systolic function, which was not evaluated in the present study, becomes vital in maintaining ventricular filling. Therefore, possible effects of pimobendan on ventricular diastolic and atrial systolic functions need further evaluation. Treatment with a single oral dose of pimobendan did not result in any major adverse events in the study cats. Vomiting occurred in cat 6 shortly after HD treatment. In cat 5, vomiting occurred around 24 h following HD treatment. The temporal relationship between dosing and symp¬toms, as well as the nature of the symptoms observed (productive vomiting associated with nausea), make an adverse drug reaction possible for cat 6 but questionable in cat 5. Minor gastro¬intestinal signs have been observed in 0—11% of pimobendan-treated cats in prior studies [17,19,20,23], and none of the cats in this study developed gastrointestinal signs with LD or water treatment. Thus, it is possible that any potential minor gastrointestinal adverse effects may be dose-dependent or not necessarily repeatable. One cat (cat 3) had a single ventricular pre¬mature complex recorded around 1 h following treatment with LD. No further arrhythmias were noted in this cat on this occasion, and arrhythmias were not noted following HD or water treatment in this cat. Although further testing to evaluate other causes of this arrhythmia were not performed, it is possible that this cat may have had a pre-existing arrhythmia which was not otherwise captured during brief electrocardiography preceding and accompanying the screening echocardiogram. There are contrasting reports regarding the effects of pimobendan on cardiac rhythm in other species. Some studies suggested pro-arrhythmic effects [40,41] while others did not document this [42—52]. To date, no pro-arrhythmic effects of pimobendan have been identified in cats [18,20]; however, large-scale evaluations for this effect have not been conducted. One cat (cat 7) had lower plasma concentrations of pimobendan and ODMP following both LD and HD when compared to other cats and was therefore excluded from group analysis. However, the AUC0—N ODMP:pimobendan ratio was similar to that of other cats, thus suggesting a similarity in the extent of metabolism of pimobendan to ODMP. Although no abnormalities were identified in the initial health assessment or during the study, it is possible that this cat had undetected gastro¬intestinal, hepatic, or plasma protein abnormal¬ities that contributed towards lower bioavailability or altered distribution of the drug. The inclusion of serum biochemistry in the screening examination or retrospective diagnostic testing of gastro¬intestinal function may have provided further insight. Alternatively, it is possible that the data from this cat may be representative of one end of the spectrum of drug concentrations in the general population of cats. A population-based pharma¬cokinetic study in a larger number of individuals may aid in further evaluation of this anomaly. There were a number of other limitations in this study that may have influenced our findings. This study utilised a reduced sampling protocol for blood collection which resulted in depletion of around 6% of the total blood volume each week in the smallest cat. This protocol did not allow for identification of the ascending phase of plasma concentrations in the majority of cats. Thus, the true Cmax and Tmax may not have been captured. Although a higher number of plasma samples may have facilitated a more accurate pharmacokinetic analysis, this had to be balanced with the effect of bleeding on the cardiovascular system. Ideally, the between-day coefficient of variation for the car¬diologist should also have been assessed, and the gender of cats and order of treatment should have been fully balanced. The small number of animals also precluded adjustments for these imbalances in the statistical model. Had the treatment effects been more readily appreciable, the data could have also been ana¬lysed using simultaneous pharmacokinetic- pharmacodynamic modelling to provide further insight on the dose-response relationship. Based on our findings, however, it would seem that evaluating a wider range of cardiovascular parameters to monitor treatment effects and employing further measures to minimise anxiety in the study cats would be advisable to obtain more reliable data for this purpose. Pimobendan is marketed as a racemic mixture; however, stereoselective pharmacokinetics and pharmacodynamics have been observed in prior studies [6,53—56]. Thus, evaluation of enantiomer kinetics and effects may also aid in refining such a model to describe the dos¬e—response relationship in this species. The data from this study were collected from healthy cats; however, the effect of drug treat¬ment may be different in cats with cardiovascular disease. In addition, this drug is typically admin¬istered chronically, thus necessitating further evaluations in the form of multidose studies. Ultimately, further pharmacological inves¬tigations and rigorous prospective clinical trials in cats with cardiovascular diseases are required to clarify the optimal dosing regimen, identify whether cardiovascular effects are detectable in the target animals for this drug, and whether these effects translate to positive clinical outcomes. Pimobendan treatment was well-tolerated in fasted cats. Minor potential adverse effects con¬sisting of vomiting and documentation of a single ventricular premature contraction were observed in our study. The results from this study suggest a reduced metabolism of pimobendan into the active metabolite in cats compared to dogs. Treatment effects with pimobendan at both 1.25 mg (HD) and 0.625 mg (LD) were observed in measures of systolic function; however, the duration of action and differences in effects between the two pimobendan doses could not be characterised. These findings can be used to guide further investigations into the safety and efficacy of pimobendan treatment in feline patients. M. Yata received financial support from Luoda Pharma, the Eric Horatio Maclean Scholarship, and Goldia and Susie Lesue Scholarship whilst undertaking this project. Luoda Pharma sponsored additional studies evaluating pimobendan in dogs which were conducted byM. Yata, A. McLachlan, D. Foster, and N. Beijerink. Luoda Pharma also contributed towards UHPLC-MS analysis of plasma samples; however, Luoda Pharma did not provide the pimobendan product used in this study. Interim results of this study were presented at the 2015 ECVIM congress. This study was funded by the Thea Jean Schnakenberg Bequest, J.M & J.R. Stewart Legacy, and Margot Roslyn Flood Bequest. Luoda Pharma pro¬vided funds for UHPLC-MS analysis of plasma samples. The authors would like to thank Joe Pippia (PIA PHARMA Pty Ltd, Gladesville, NSW) for development and performance of the UHPLC-MS assay; the University Veterinary Teaching Hospital, Sydney for provision of facilities to conduct this study; Kelly Amaro and Elisabeth Newfield for their assistance with handling of the cats; Dr Navneet Dhand, Dr Peter Thomson, and Dr Alan Marcus for advice on statistical analysis. Honerjager P, Heiss A, Schafer-Korting M, Schonsteiner G, Reiter M. UD-CG 115 - a cardiotonic pyridazinone which elevates cyclic AMP and prolongs the action potential in guinea-pig papillary muscle. Naunyn Schmiedebergs Arch Pharmacol 1984;325:259—269. Ruegg JC, Pfitzer G, Eubler D, Zeugner C. Effect on con¬tractility of skinned fibres from mammalian heart and smooth muscle by a new benzimidazole derivative, 4,5- dihydro-6-[2-(4-methoxyphenyl)-1H-benzimidazol-5-yl]-5- methy l-3(2H )- pyridazinone. Arzneimittelforschung 1984; 34:1736—1738. Berger C, Meyer W, Scholz H, Starbatty J. Effects of the benzimidazole derivatives pimobendan and 2-(4-hydroxy- phenyl)-5-(5-methyl-3-oxo-4,5-dihydro-2H-6- pyridazinyl) benzimidazole HCl on phosphodiesterase activity and force of contraction in guinea-pig hearts. Arzneimittelforschung 1985;35:1668—1673. Fujino K, Sperelakis N, Solaro RJ. Sensitization of dog and guinea pig heart myofilaments to Ca2+ activation and the inotropic effect of pimobendan: comparison with milrinone. Circ Res 1988;63:911—922. Brunkhorst D, v. der Leyen H, Meyer W, Nigbur R, Schmidt- Schumacher C, Scholz H. Relation of positive inotropic and chronotropic effects of pimobendan, UD-CG 212 Cl, milrinone and other phosphodiesterase inhibitors to phosphodiesterase III inhibition in guinea-pig heart. Naunyn Schmiedebergs Arch Pharmacol 1989;339:575—583. Solaro RJ, Fujino K, Sperelakis N. The positive inotropic effect of pimobendan involves stereospecific increases in the calcium sensitivity of cardiac myofilaments. J Cardiovasc Pharmacol 1989;14:S7—S12. Remme WJ, Wiesfeld ACP, Look MP, Kruyssen HACM. Hemodynamic effects of intravenous pimobendan in patients with left ventricular dysfunction. J Cardiovasc Pharmacol 1989;14:S41-S44. Asanoi H, Ishizaka S, Kameyama T, Ishise H, Sasayama S. Disparate inotropic and lusitropic responses to pimo¬bendan in conscious dogs with tachycardia-induced heart failure. J Cardiovasc Pharmacol 1994;23:268-274. Remme WJ, Kruijssen DA, van Hoogenhuyze DC, Krauss HX, Bartels LG, Storm CJ, de Leeuw PW. Hemodynamic, neu¬rohumoral, and myocardial energetic effects of pimo- bendan, a novel calcium-sensitizing compound, in patients with mild to moderate heart failure. J Cardiovasc Phar¬macol 1994;24:730-739. Ishiki R, Ishihara H, Izawa H, Nagata K, Hirai M, Yokota M. Acute effects of a single low oral dose of pimobendan on left ventricular systolic and diastolic function in patients with congestive heart failure. J Cardiovasc Pharmacol 2000;35:897-905. Hasenfuss G, Holubarsch C, Just H, Blanchard E, Mulieri L, Alpert N. Energetic aspects of inotropic interventions in rat myocardium. In: Jacob R, Just H, Holubarsch C, editors. Cardiac Energetics: Basic Mechanisms and Clinical Implications. Springer Science & Business Media; 2013. p. 251 -259. Holubarsch C, Hasenfuss G, Just H, Blanchard E, lieri LA, Alpert NR. Influence of the positive inotropic substance pimobendan (UD-CG 115 BS) on contractile economy of guinea pig papillary muscles. J Cardiovasc Pharmacol 1989; 14:S13-S17. Verdouw PD, Hartog JM, Duncker DJ, Roth W, Saxena PR. Cardiovascular profile of pimobendan, a benzimidazole- pyridazinone derivative with vasodilating and inotropic properties. Eur J Pharmacol 1986;126:21-30. Fujimoto S. Effects of pimobendan, its active metabolite UD-CG 212, and milrinone on isolated blood vessels. Eur J Pharmacol 1994;265:159-166. Bohm M, Morano I, Pieske B, Ruegg JC, Wankerl M, Zimmermann R, Erdmann E. Contribution of cAMP- phosphodiesterase inhibition and sensitization of the contractile proteins for calcium to the inotropic effect of pimobendan in the failing human myocardium. Circ Res 1991;68:689-701. Endoh M, Shibasaki T, Satoh H, Norota I, Ishihata A. Different mechanisms involved in the positive inotropic effects of benzimidazole derivative UD-CG 115 BS (pimobendan) and its demethylated metabolite UD-CG 212 Cl in canine ventricular myocardium. J Cardiovasc Pharmacol 1991;17:365-375. MacGregor JM, Rush JE, Laste NJ, Malakoff RL, Cunningham SM, Aronow N, Hall DJ, Williams J, Price LL. Use of pimobendan in 170 cats (2006-2010). J Vet Cardiol 2011;13:251-260. Gordon SG, Saunders AB, Roland RM, Winter RL, Drourr L, Achen SE, Hariu CD, Fries RC, Boggess MM, Miller MW. Effect of oral administration of pimobendan in cats with heart failure. J Am Vet Med Assoc 2012;241:89-94. Hambrook LE, Bennett PF. Effect of pimobendan on the clinical outcome and survival of cats with non-taurine responsive dilated cardiomyopathy. J Feline Med Surg 2012;14:233-239. Reina-Doreste Y, Stern JA, Keene BW, Tou SP, Atkins CE, DeFrancesco TC, Ames MK, Hodge TE, Meurs KM. Case- control study of the effects of pimobendan on survival time in cats with hypertrophic cardiomyopathy and con¬gestive heart failure. J Am Vet Med Assoc 2014;245: 534-539. Von Meel JCA. Cardiovascular effects of the positive ino¬tropic agents pimobendan and sulmazole in vivo. Arznei- mittelforschung 1985;35:284-288. Kent AM. Effects of atenolol, ivabradine and pimobendan on left atrial and left atrial appendage function: an echocardiographic study in healthy cats. Electronic Thesis or Dissertation. Ohio State University; 2011. OhioLINK Electronic Theses and Dissertations Center. 02/04/2014. Hanzlicek AS, Gehring R, KuKanich B, KuKanich KS, Borgarelli M, Smee N, Olson EE, Margiocco M. Pharmacokinetics of oral pimobendan in healthy cats. J Vet Cardiol 2012;14:489-496. Ingelheim Boehringer. Vetmedin (pimobendan) chewable tablets [package insert]. MO, USA: St. Joseph; 2012. Yata M, McLachlan AJ, Foster DJR, Page SW, Beijerink NJ. Pharmacokinetics and cardiovascular effects following a single oral administration of a nonaqueous pimobendan solution in healthy dogs. J Vet Pharmacol Ther 2016;39: 45-53. Zhang Y, Huo M, Zhou J, Xie S. PKSolver: an add-in program for pharmacokinetic and pharmacodynamic data analysis in Microsoft Excel. Comput Methods Programs Biomed 2010;99:306-314. Kuriya S-i, Ohmori S, HinoM, Ishii I, Nakamura H, Senda C, Igarashi T, Kiuchi M, Kitada M. Identification of cytochrome P-450 isoform (s) responsible for the metabolism of pimobendan in human liver microsomes. Drug Metab Dispos 2000;28:73-78. Pahernik S, Schmid J, SauterT, Schildberg FW, Koebe HG. Metabolism of pimobendan in long-term human hepatocyte culture: in vivo-in vitro comparison. Xenobiotica 1995;25:811-823. Chauret N, Gauthier A, Martin J, Nicoll-Griffith DA. In vitro comparison of cytochrome P450-mediated metabolic activities in human, dog, cat, and horse. Drug Metab Dispos 1997;25:1130-1136. Chiu S-HL, Huskey S-EW. Species differences in N-glucur- onidation: 1996 ASPET N-glucuronidation of xenobiotics symposium. Drug Metab Dispos 1998;26:838-847. Shah SS, Sanda S, Regmi NL, Sasaki K, Shimoda M. Char¬acterization of cytochrome P450-mediated drug metabolism in cats. J Vet Pharmacol Ther 2007;30: 422-428. Van Beusekom CD, Schipper L, Fink-Gremmels J. Cytochrome P450-mediated hepatic metabolism of new fluorescent substrates in cats and dogs. J Vet Pharmacol Ther 2010;33:519-527. Van Beusekom CD, Fink-Gremmels J, Schrickx JA. Com¬paring the glucuronidation capacity of the feline liver with substrate-specific glucuronidation in dogs. J Vet Pharmacol Ther 2014;37:18-24. Court MH. Feline drug metabolism and disposition: pharmacokinetic evidence for species differences and molecular mechanisms. Vet Clin North Am Small Anim Pract 2013;43:1039-1054. Boon JA. Appendix four: feline reference ranges. In: Vet¬erinary Echocardiography. 2nd ed. West Sussex, UK: Wiley- Blackwell; 2011. p. 570-575. Acierno MJ, Seaton D, Mitchell MA, da Cunha A. Agreement between directly measured blood pressure and pressures obtained with three veterinary-specific oscillometric units in cats. J Am Vet Med Assoc 2010;237:402-406. Pedersen KM, Butler MA, Ersb0ll AK, Pedersen HD. Evalu¬ation of an oscillometric blood pressure monitor for use in anesthetized cats. J Am Vet Med Assoc 2002;221:646-650. Branson KR, Wagner-Mann CC, Mann FA. Evaluation of an oscillometric blood pressure monitor on anesthetized cats and the effect of cuff placement and fur on accuracy. Vet Surg 1997;26:347-353. Caulkett NA, Cantwell SL, Houston DM. A comparison of indirect blood pressure monitoring techniques in the anesthetized cat. Vet Surg 1998;27:370-377. Lynch JJ, Kitzen JM, Hoff PT, Lucchesi BR. Effects of pimobendan (UD-CG 115 BS), a new positive inotropic agent, on ventricular tachycardia and ischemic ventricular fibrillation in a conscious canine model of recent myo¬cardial infarction. J Cardiovasc Pharmacol 1988;12: 547-554. Hagemeijer F, Brand HJ, Roth W. Cardiovascular effects and plasma level profile of pimobendan (UD-CG 115 BS) and its metabolite UD-CG 212 in patients with congestive heart failure after single and repeated oral dosing. J Cardiovasc Pharmacol 1989;14:302-310. Baumann G, Ningel K, Permanetter B. Clinical efficacy of pimobendan (UD-CG 115 BS) in patients with chronic congestive heart failure. J Cardiovasc Pharmacol 1989;14: S23-S30. Hauf GF, Grom E, Roskamm H. Acute and long-term hemodynamic effects of pimobendan (UD-CG 115 BS) in comparison with captopril. J Cardiovasc Pharmacol 1989; 14:S49-S56. Katz SD, Kubo SH, Jessup M, Brozena S, Troha JM, Wahl J, Cohn JN, Sonnenblick EH, LeJemtel TH. A multicenter, randomized, double-blind, placebo-controlled trial of pimobendan, a new cardiotonic and vasodilator agent, in patients with severe congestive heart failure. Am Heart J 1992;123:95-103. Kubo SH, Gollub S, Bourge R, Rahko P, Cobb F, Jessup M, Brozena S, Brodsky M, Kirlin P, Shanes J. Beneficial effects of pimobendan on exercise tolerance and quality of life in patients with heart failure: results of a multicenter trial. Circulation 1992;85:942-949. Lubsen J, Just H, Hjalmarsson A, La Framboise D, Remme W, Heinrich-Nols J, Dumont J, Seed P. Effect of pimobendan on exercise capacity in patients with heart failure: main results from the Pimobendan in Congestive Heart Failure (PICO) trial. Heart 1996;76:223-231. Kato K, Iizuka M, Yazaki Y, Sasayama S, Nakashima M, Ohashi Y, Kato K, Sasayama S, Izumi T, Hori M. Effects of pimobendan on adverse cardiac events and physical activities in patients with mild to moderate chronic heart failure-the effects of pimobendan on chronic heart failure study (EPOCH study). Circ J 2002;66:149-157. Ouellet M, Belanger M, Difruscia R, Beauchamp G. Effect of pimobendan on echocardiographic values in dogs with asymptomatic mitral valve disease. J Vet Intern Med 2009; 23:258-263. Summerfield N, Boswood A, O'Grady M, Gordon S, Dukes- McEwan J, Oyama M, Smith S, Patteson M, French A, Culshaw G. Efficacy of pimobendan in the prevention of congestive heart failure or sudden death in Doberman Pinschers with preclinical dilated cardiomyopathy (The PROTECT Study). J Vet Intern Med 2012;26:1337-1349. Caro A, Ynaraja E, Montoya JA. Effects of short-term treatment with pimobendan in dogs with myxomatous valve disease. J Appl Anim Res 2009;35:113-117. Haggstrom J, Boswood A, O'Grady M, Jons O, Smith S, Swift S, Borgarelli M, Gavaghan B, Kresken JG, Patteson M, Ablad B, Bussadori CM, Glaus T, Kovacevic A, Rapp M, Santilli RA, Tidholm A, Eriksson A, Belanger MC, Deinert M, Little CJL, Kvart C, French A, R0nn-Landbo M, Wess G, Eggertsdottir AV, O'Sullivan ML, Schneider M, Lombard CW, Dukes-McEwan J, Willis R, Louvet A, DiFruscia R. Effect of pimobendan or benazepril hydrochloride on survival times in dogs with congestive heart failure caused by naturally occurring myxomatous mitral valve disease: the QUEST study. J Vet Intern Med 2008;22:1124-1135. Lake-Bakaar GA, Singh MK, Kass PH, Griffiths LG. Effect of pimobendan on the incidence of arrhythmias in small breed dogs with myxomatous mitral valve degeneration. J Vet Cardiol 2015;17:120-128. Fujino K, Sperelakis N, Solaro RJ. Differential effects of d- and l-pimobendan on cardiac myofilament calcium sensitivity. J Pharmacol Exp Ther 1988;247:519-523. Chu K-M, Shieh S-M, Hu OY-P. Pharmacokinetics and phar¬macodynamics of enantiomers of pimobendan in patients with dilated cardiomyopathy and congestive heart failure after single and repeated oral dosing. Clin Pharmacol Ther 1995;57:610-621. Chu K-M, Shieh S-M, Hu OY-P. Plasma and red blood cell pharmacokinetics of pimobendan enantiomers in healthy Chinese. Eur J Clin Pharmacol 1995;47:537-542. Bell ET, Devi JL, Chiu S, Zahra P, Whittem T. The pharmacokinetics of pimobendan enantiomers after oral and intravenous administration of racemate pimobendan formulations in healthy dogs. J Vet Pharmacol Ther 2016;39: 54-61.